Facebook has mapped the connectedness of countries around the globe and has made the results available to the public through its Facebook Stories web site. 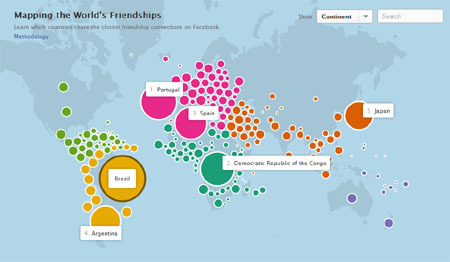 The page is entitled “Mapping the World’s Friendships.” The rankings, according to the page, are based on the amount of connections between countries while also taking into account the total number of connections within each country. Mia Newman, author of the post, noted that immigration seems to be the most important factor in these inter-country friendships or connections. Also influencing the connections are economic links between countries along with relationships established as far back as the colonial era. Some of the rankings are rather obvious, such as the connectedness of the United Kingdom with its former colonies along with the closeness of neighbours Australia and New Zealand. Others are not too obvious, such as the high rate of connection between Brazil and Japan. Newman herself explains that, after research, a strong migration between the countries occurred dating back to the seventies. Surprisingly, the connection between the United States and the Philippines is not as strong as one would have suspected. This is probably because the Middle East has become more of a destination for Filipino immigrants. In the case of the United States, there are probably more Latin immigrants in the country than Filipinos.